Trigonometry is originally the study of the correlation between the sides and angles of a triangle. Trigonometry is also called plane trigonometry because the triangle is described on a plane. When the triangle is described on a spherical surface, it is called spherical trigonometry. An angle is defined as the inclination of one straight line to another straight line about a point in geometry but a more boarder meaning is used in trigonometry where angle is the revolution of a ray refered to a fixed ray with a common vertex and the angular motion can be either counter clockwise or clockwise. Angle measurement in trigonometry is therefore can be greater than π or 2π in general. Let θ be the angle of APB in radian and a be the subtending arc by angle θ at radius r. Let π be the straight angle. Then angle (π/2-θ) is called the complement of θ and angle (π-θ) is called the supplement of θ. Similarly arc b is called the complement of a and arc c is called the supplement of a. From geometry, the ratio of the circumference of any circle over its radius is equal to a constant quantity 2π. Since angle at C is proportional to the subtending arc. Therefore an angle can be expressed in term of the arc subtended by proportional, rθ/2πr=θ/2π. When the arc length is equal to the radius, by proportional, r/2πr=1/2π, the quantity from radius is called one radian. A right angle is equal to π/2 and a straight angle is equal to π. Another way to measure an angle is by dividing the circumference of a complete circle into 360 equal portions. 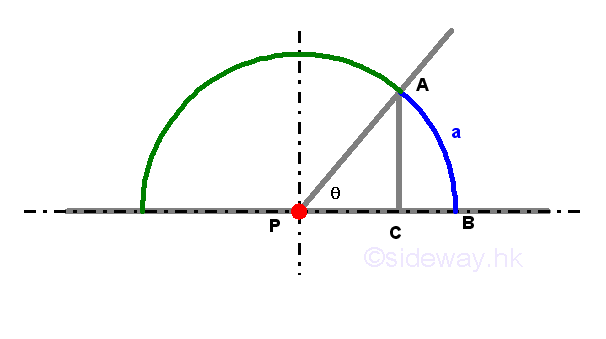 The angle subtended by one portion of the divided arc is equal to one degree. Each degree can be divided into 60 equal parts call minutes. Each minute can further be divided into 60 equal parts call seconds. A right angle is therefore equal to 90 degrees and a straight angle is equal to 180 degrees. The division of circumference of a circle into 360 degrees is called the sexagesimal divison which is difference from those division by dividing a circle into 100 degress called centesimal. 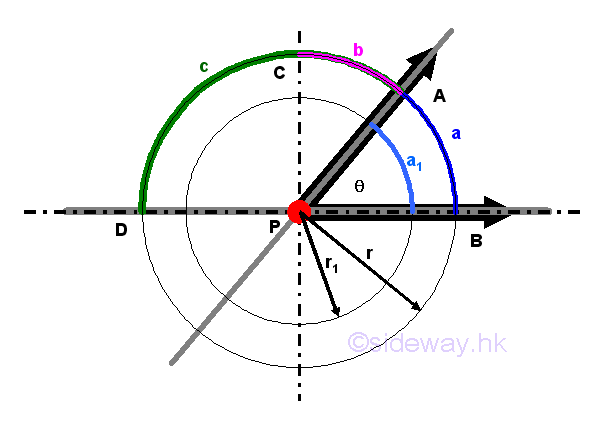 Since both radian and degree are dervied from the circumference of a circle, both measurements can be converted to each other through a simple relationship, i.e. degree/360=radian/2π.